Axon Cerebrum selected for facility control at France TF1. Looking for maximum flexibility as well as ease of use for operators (including non-technical staff), French broadcaster TF1 has deployed a facility control system from Axon Digital Design to manage its new Riedel Communications distributed audio/video router. TF1 operates five television channels in France as well as several special interest pay-TV channels and their digital offshoots. Part of the TF1 Group, the broadcaster has an average market share of 20.3%, making it the most popular domestic network in France and its channels among the most viewed in Europe. Axon’s Cerebrum Master Control software offers the functionality and broad range of features that TF1 needed to manage its audio/video processing, multiviewer and tally/UMD management. Cyril Bernard, TF1’s Support & System Manager, said they needed a versatile control system that could handle incoming feeds and audio returns for their control rooms, all routed through the Riedel system. Axon Cerebrum software enables complex switching to take place in a very short timeframe and can be customized to meet individual needs. “We looked at various systems on the market but chose Cerebrum because it met all our criteria and was so simple to use that even non-technical staff such as journalists could easily get to grips with it,” he said. Richard Couzon, Axon’s Business development manager for France and French-speaking countries, added that TF1’s set-up requires complex switching to take place in a very short timeframe, so they needed a system that could be customized to meet their exact needs. 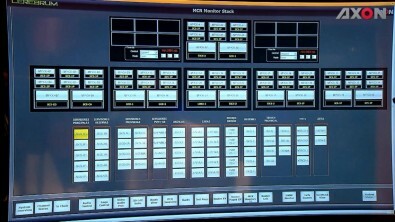 Although router control was the main requirement, TF1 also wanted a system that could be expanded to other devices such as multiviewers, intercom systems and tallies. By acting as the nerve center for all routing activities, the Cerebrum software simplifies multi-device monitoring and control onto a single interface. It supports a wide range of devices from different manufacturers—including routers, production switchers, servers, receiver decoders, multiviewers and waveform monitors—using either SNMP (Simple Network Management Protocol) or third-party protocols. TF1’s Bernard said they will expand the system in early 2019 so that it can control more devices. The times they are a changin’ and faster than ever. For the first time, digital advertising in the United States will surpass the amount of money spent on traditional ads used by television and print media, a research firm predicts. The mobile video boom will continue over the next few years and consume an ever-greater proportion of overall global network backbone capacity, according to the latest update of the Cisco Mobile Visual Networking Index (MVNI) Forecast (2017 – 2022).